As rallying calls for delivery of public transport go, that’s an impressive statement of intent – but then, Aberdeenshire Council’s Martin Hall and his team are doing impressive work, as we quickly discover on our visit to the council office. But perhaps most remarkably of all – and this is not a message you hear every day – this is a transport department that is actually expanding through this era of austerity. We paid a visit to find out how. The setting for our meeting is the council canteen – a more glamorous location than you might imagine, featuring stunning views over countryside and the city of Aberdeen, and out into the North Sea. As Principal Officer for Information and Infrastructure in Aberdeenshire Council’s Public Transport Unit, Martin Hall manages the publicity and marketing of bus services. His team is one of four within the council’s PTU unit (others are the Local Bus Services team, DRT and Fares team, and Client Transport team). As already mentioned, while so many UK Local Authority teams are shrinking, the team’s remit is actually expanding, having recently grown from four to five team members. Though it is tempting to assume this is due to the relative affluence of the Aberdeenshire area, we quickly realise that would be a mistake. “We have the same challenges as other areas; we are facing budgetary pressures, and the concept of ‘spend to save’ is nothing new: we’ve had to justify every piece of procurement the entire six years I have been here,” explains Martin. “We are expanding because we’re taking on more work, working with neighbouring authorities, where the operators want us to replicate the success we have had in the shire with roadside public transport information and are providing funding to achieve this,” he says. Inspired by the success of the expansion of the roadside publicity and with a desire to share resources, Aberdeen City and bus operators are interested in seeing the RTPI system expanded to include bus services in the City. Ordinarily such a project might present a significant headache, but fortunately Martin and the team built expansion capacity into their original plans, and embraced a flexible modular technology solution – more on this later. But this kind of expansion doesn’t tend to occur without good foundations – and in this instance that means a strong team with good understanding of what it takes to deliver quality public transport information, and flexible technology that can accommodate the new requirements. But for now let’s return to the fact that this is a relatively affluent area, which of course presents a particular challenge for those with a remit to promote public transport: affordability of car ownership. “Aberdeenshire has one of the highest car ownerships in Scotland. We have a lot of congestion and not enough effective bus priority,” Martin explains. Delving further, this emphasis on delivering the best possible service is a core objective that resonates through the entire council, not only the PTU. Indeed, every office wall has a printed statement proudly promoting the ideal of creating the best area and council. And as far as public transport goes, satisfaction surveys indicate the initiative is succeeding: “Our surveys show that our customers are satisfied with the service provided, with satisfaction levels higher than the national average,” Martin reveals. But of course there remains the familiar problem of how to convince non-regular users to give the bus a try. The same surveys that show high bus user satisfaction also reveal the extent of the challenge: “There’s a gulf between the perception of bus travel by users and non-users,” Martin explains. 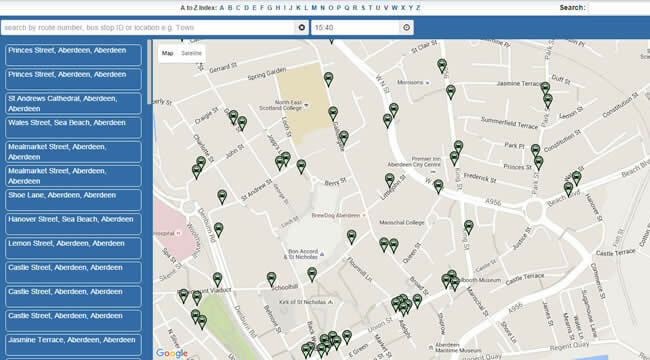 Unsurprisingly, technology is a central part of the plan to change all this, with Aberdeenshire having implemented Trapeze’s NOVUS solution to manage not only real-time information, but also fixed route data management, publicity production and a new web portal that shows live departure boards around the shire. 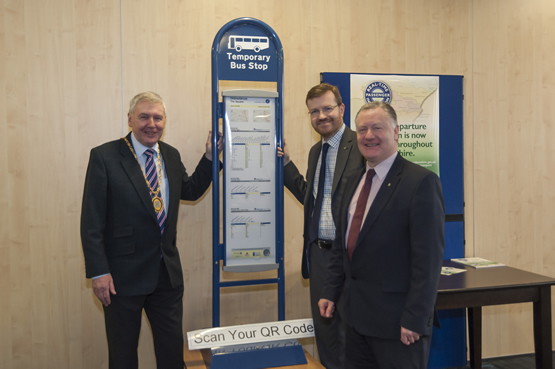 The result is a set of stylish and branded Aberdeenshire outputs incorporating local maps and QR codes for accessing live departures. But isn’t all this emphasis on printed material a little old outdated now? “In the past I might have questioned it myself, but we just endured a service change where some information come in late – and we had a huge number of calls as a result,” reveals Martin. Perhaps surprisingly, the dynamic of those calling was diverse, including young and old: “It underlined the importance of roadside materials in terms of providing comfort,” Martin concludes. At this point our discussion shifts to the ways in which printed publicity is blurring the lines between schedule and real-time information through use of QR codes that can be scanned to obtain live data. Aberdeenshire were actually early adopters of QR Codes some four years ago: “We’re a large rural authority; we can’t have screens at every stop so we had to find other ways to inform customers,” Martin explains. 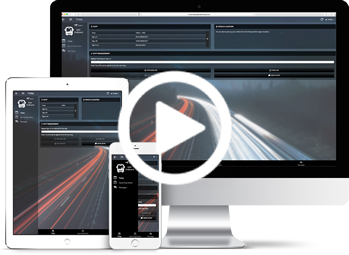 “And with our new website (delivered via Trapeze’s NOVUS Live Travel Suite) we can now offer customers the ability to plan their journey wherever they are. At-stop signs are great, but they can’t help you pre-plan a journey because you don’t see them till you’re actually at the stop,” Martin concludes. As indicated by the early QR Code adoption and willingness to embrace the entire NOVUS suite, technological innovation is at the heart of the council’s activity, but Martin insists it must be done in a way that is right for the customer: “Our objective is to be the best, and to achieve that you need to innovate; not because you want to be first, but because you want to find ways to be more effective and efficient,” he says. Throughout our discussion, partnership is another recurring theme, both in terms of working with local stakeholders and operators. “We were the driving force for the initial real-time installation in Aberdeenshire, but it would never have happened across the whole area so quickly without operator buy-in,” Martin explains. This sense of a common goal can be clearly seen in the Grasshopper Pass, a multi-operator ticket that covers travel in the Aberdeenshire area on any of the 14 participating operators’ buses. 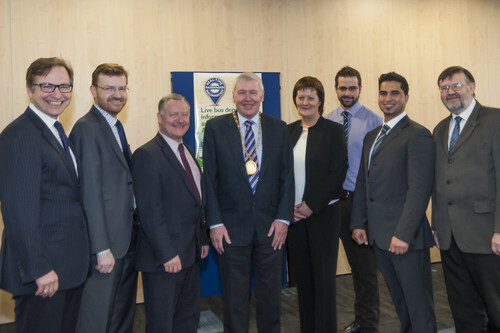 Though the initiative was led by the operators, Aberdeenshire Council have assisted discussions in the role of administrator while Aberdeen City Council and Nestrans, the Regional Transport Partnership, have also supported the initative. And this partnership approach also extends to suppliers such as Trapeze, who not only support delivery of fixed route services via the NOVUS suite, but also provide the PASS system that manages operations of the Demand Responsive Transport team. Upon departing, we decide to put the technology to the test. A glance at the Aberdeenshire web portal indicates the 23 service is required – with a bus set to arrive in either six or 13 minutes. Our vehicle arrives right on cue and is indeed frequent, reliable and clean. So it looks like Aberdeenshire and their partners are getting those basics right – but then, of course, we never doubted it for a second. UPDATE: Aberdeenshire Council was named Local Transport Authority of the Year at the Scottish Transport Awards 2016.